Description of "Some Reflections on Ethics"
"The aim of a rational ethics should be to maximize freedom and avenues of happiness and to minimize avoidable suffering." In this highly thought provoking and stimulating book, the author, Dr. Ramendra, has briefly and critically discussed the ethical ideas of G. E. Moore, Bertrand Russell, Lokayat, Buddha, Epicurus and John Stuart Mill before expounding his own ideas in a logical manner. The author has convincingly advocated a rational ethics based on human needs and desires. Dr. Ramendra (full name "Ramendra Nath") is presently working as Associate Professor and Head of the Department of Philosophy at Patna College, Patna University, India; where he has been teaching for thirty one years. He is a double gold medalist and double research degree holder from Patna University. His Ph. D was on "The Ethical Philosophy of Bertrand Russell" and his D. Lit. was on "M. N. Roy's New Humanism and Materialism". Both these works have been published as books. Dr. Ramendra is the author of nearly thirty books and booklets in Hindi and English, including 'Why I am Not a Hindu', 'Is God Dead?' and 'The Myth of Unity of all Religions'. Besides, he has written hundreds of articles in newspapers, magazines and journals. 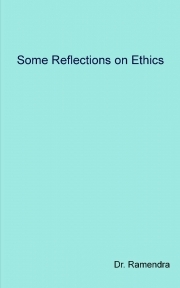 Reviews of "Some Reflections on Ethics"